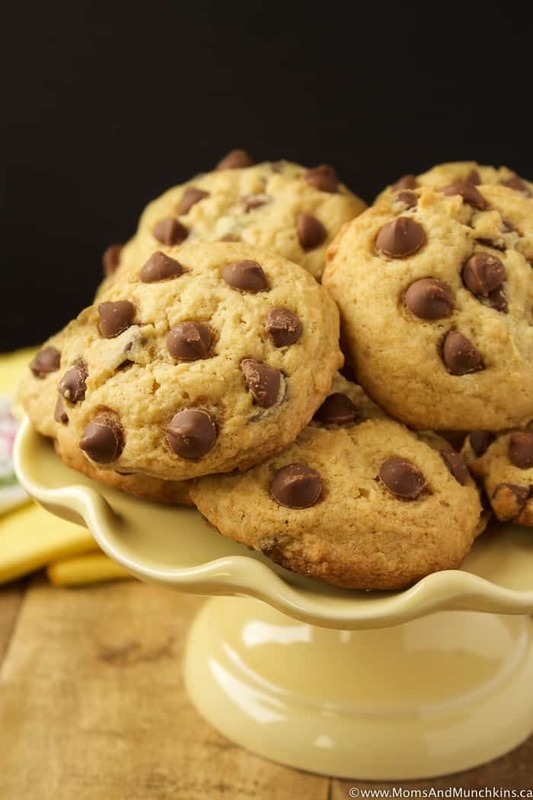 These Banana Chocolate Chip Cookies are soft, fluffy cookies that make a perfect after school snack! The recipe uses a real banana plus an instant banana cream pudding mix. 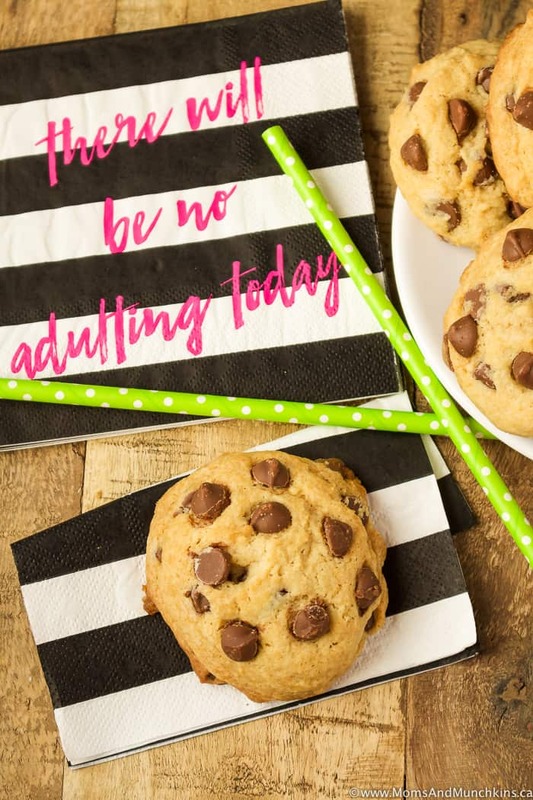 These cookies are super easy to make and they freeze really well – they probably won’t last long enough to make it to the freezer though! You can never have too much chocolate, right? 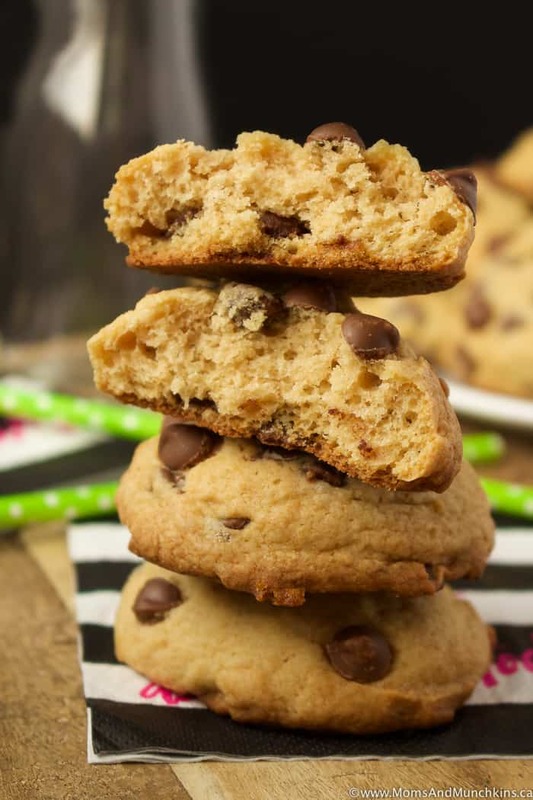 These cookies have milk chocolate chips stirred into the batter plus they are topped with even more milk chocolate chips. Yummy chocolate in every bite! In a large bowl, beat together the butter and sugars until well mixed. Beat in the eggs, vanilla and mashed banana. In a separate bowl, combine the flour, baking soda and baking powder. Stir to mix. Combine the dry ingredients into the wet ingredients. Beat just until mixed. Stir in 2 cups of the milk chocolate chips. Set the last cup of chocolate chips aside for later. Line a cookie sheet with a silicone baking mat and scoop cookies into 2-tablespoon sizes (you'll get about 3 dozen cookies from this recipe). 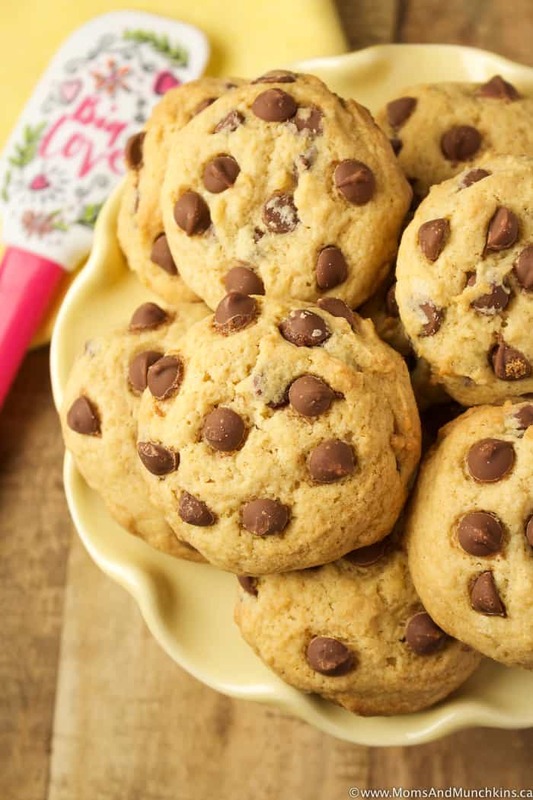 Using the remaining cup of chocolate chips, press chocolate chips into the top of each unbaked cookie. Bake for 15-17 minutes (until bottom of cookies are a light golden brown and tops of cookies still look light and soft). Once cookies are removed from oven, leave them on the cookie sheet to cool for 5 minutes before placing them on a wire rack to cool completely. Love banana desserts? 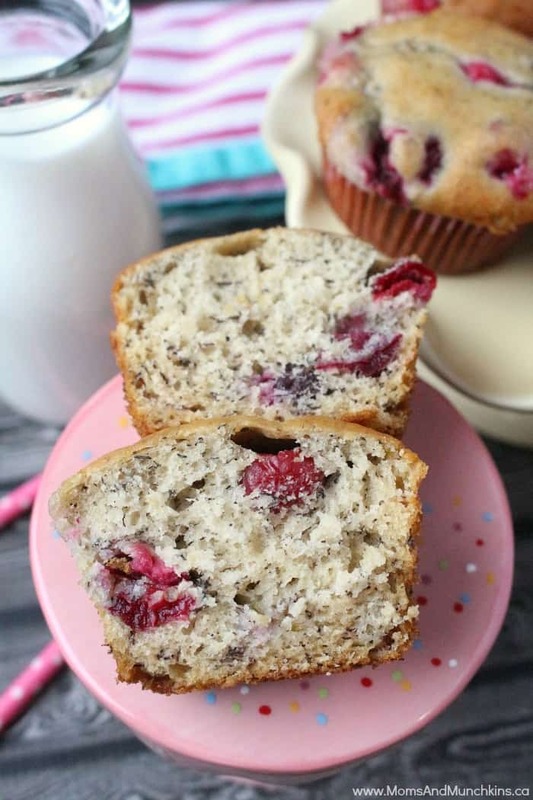 Check out one of our favorites – Banana Cranberry Muffins! You can replace the cranberries in these for a special treat! 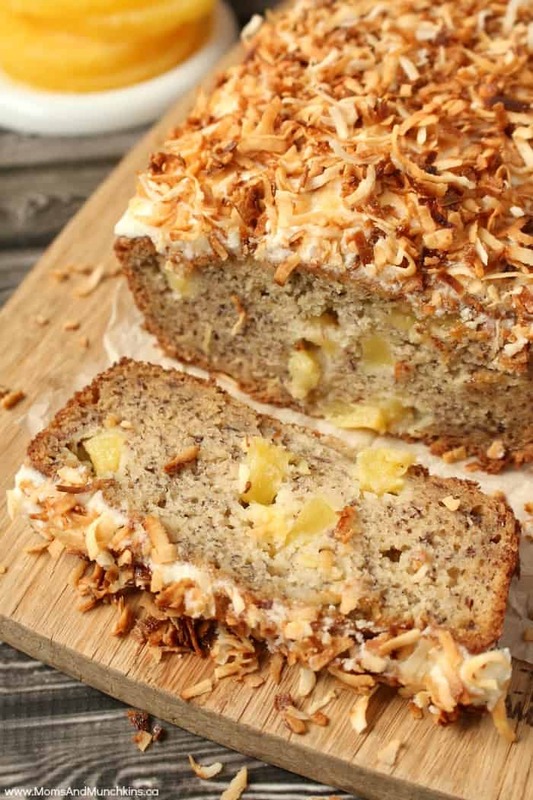 Another one of my favorites is this Tropical Banana Bread with pineapples and coconut baked right in then topped with a pineapple frosting and toasted coconut. Yum! Visit our Recipes page for even more delicious ideas. Never miss an update by following us on Instagram, Facebook, Pinterest and Twitter.